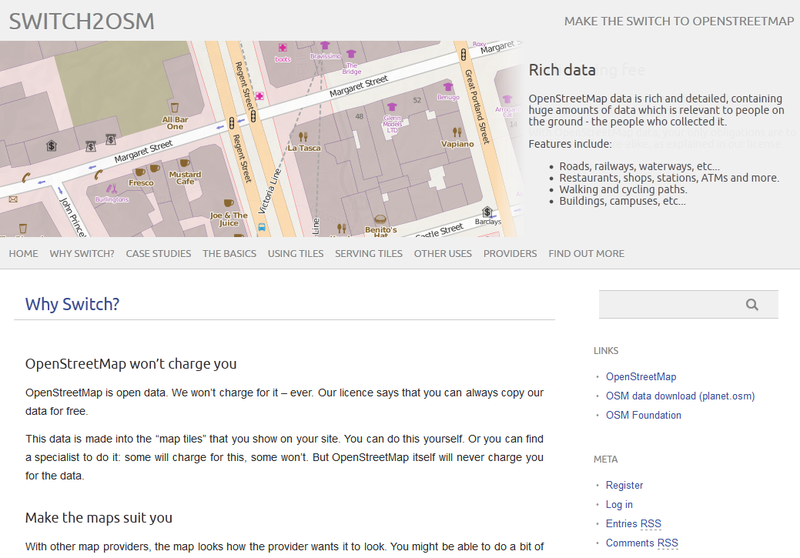 A nice clean website promoting Open Street Map. 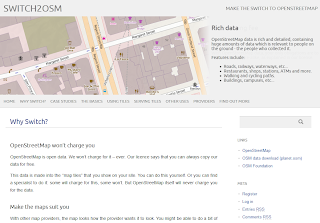 "switch2osm Make the switch to OpenStreetMap"
OpenStreetMap is open data. We won’t charge for it – ever. Our licence says that you can always copy our data for free. This data is made into the “map tiles” that you show on your site. You can do this yourself. Or you can find a specialist to do it: some will charge for this, some won’t. But OpenStreetMap itself will never charge you for the data. With other map providers, the map looks how the provider wants it to look. You might be able to do a bit of rudimentary recolouring. But it’s still their style of map, not yours. With OpenStreetMap, you’re in control. Turning the data into tiles can be done any way you like. Want to emphasise cycle routes and play down motorways? No problem. (Most other maps don’t even have cycle routes.) Want to label subway stops but ignore bus stops? Easy. There’s no limit to what you can do with OpenStreetMap. Yet it needn’t take long to get started. You can switch to OSM in under an hour using tools like the easy Leaflet API and MapQuest Open’s free tiles. Read the rest of this site to get started with the possibilities. I like the idea of using OSM, but as an ESRI / SQL Server user in the US, it is not easy at all to get the data imported for the US into a usable format (no mirrors for the US that I found, the whole planet file is very difficult to process due to memory problems even on badass machines, individual extracts using the map are not possible for large areas). Perhaps it is time to take yet another look at the export and conversion options that are available.